Joining a growing number of luxury auto makers, Audi unveiled a new all-electric SUV. Called the E-Tron, the SUV will be available in Europe later this year and in the United States next spring. 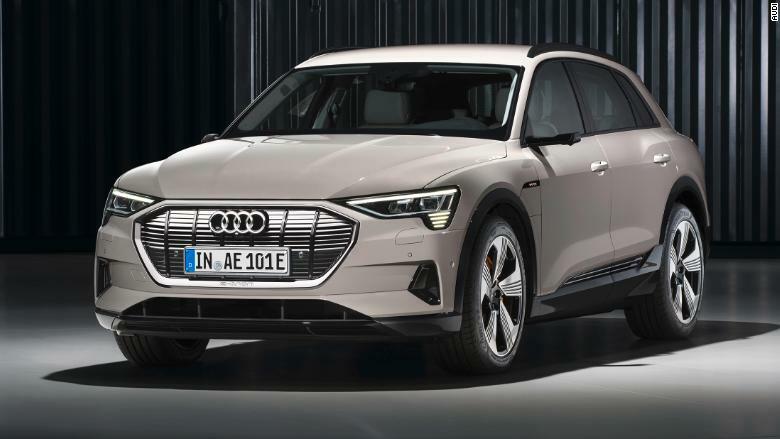 Audi said it is taking refundable $1,000 deposits for the E-Tron starting now. Prices will start at about $75,000 or $86,700 for well-equipped "First Edition" models. It's the first of three new electric vehicles Audi will introduce over the next few years. The German luxury automaker, which is part of the Volkswagen Group (VLKPF), also announced it is partnering with Amazon to handle installation of home charging stations for E-Tron buyers. The E-Tron was revealed at an event on the San Francisco waterfront. Hundreds of drones formed Audi's four ring logo over a former Ford factory turned event space. 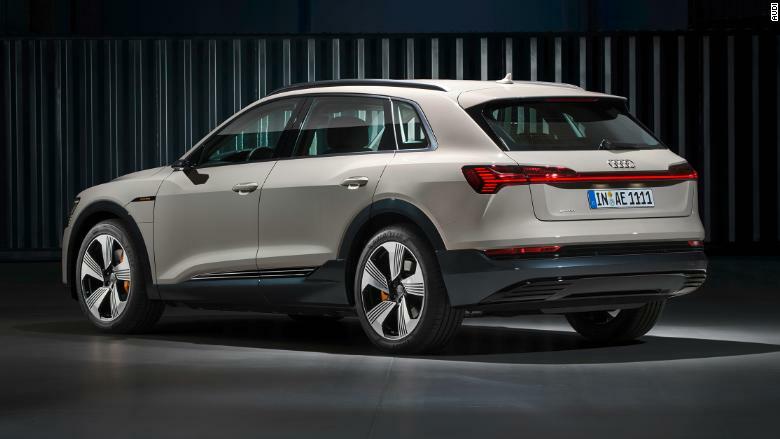 The SUV was unveiled here because the E-Tron was designed with the US market especially on mind, Audi executives said. While it might not generate the excitement of a Tesla unveiling -- that company received hundreds of thousands of dollars in deposits for its Model 3 within hours of that car's debut -- the E-Tron increases the competitive pressure. The E-Tron follows Jaguar's I-Pace electric SUV. Mercedes and BMW also recently unveiled electric SUVs that will go on sale within the next couple of years. These offerings are all SUVs mostly because the market, in general, has shifted heavily in that direction. "We wanted to be in the SUV space because we saw the growth and we wanted to be in the sweet spot of the market," said Filip Brabec, Audi's vice president for product development. Car shoppers considering an electric car today are no longer interested in their vehicle looking radically different from anything else on the road, said Brabec. The Audi E-Tron has a trademark looking Audi grill that lets in air to help cool the battery. The E-Tron looks, quite clearly, like an Audi SUV. It even has Audi's famous trapezoidal grill, a key branding feature, despite not needing a radiator. The grill allows air to pass through under the battery to provide some additional cooling. There are some unique attributes, though. The E-Tron stands a little wider than Audi's other SUVs. Slats running across the rear bumper draw attention to the car's lack of tailpipes, while there are lights in the front that are designed to look like the bars of a charge status indicator. The Audi E-Tron has two touch screens inside and, in European models, cameras instead of side mirrors. In Europe, the E-Tron won't have traditional side mirrors. Instead, it will have a camera on each side where mirrors would ordinarily be. The views from those cameras will be displayed on screens inside the vehicle. That system will not be available in the United States because safety regulations here don't allow for it. Audi executives said they are working with the National Highway Traffic Safety Administration to bring this feature to the American market. A dark colored section along the side of the E-Tron calls out the fact that there is a battery pack there. With two electric motors, the all-wheel-drive SUV can accelerate from zero to 60 miles an hour in 5.5 seconds and it has a top speed of 124 miles an hour. It will be able to tow as much as 4,000 pounds. Audi has not yet announced what its driving range will be on a full charge. When the E-Tron is cruising, rather than accelerating, it is driven mostly by the rear motor. Engineers put a heavy emphasis on recuperating as much energy as possible while driving. That's generally done as a vehicle brakes or slows by allowing the wheels to push the electric motors, which then act as generators. 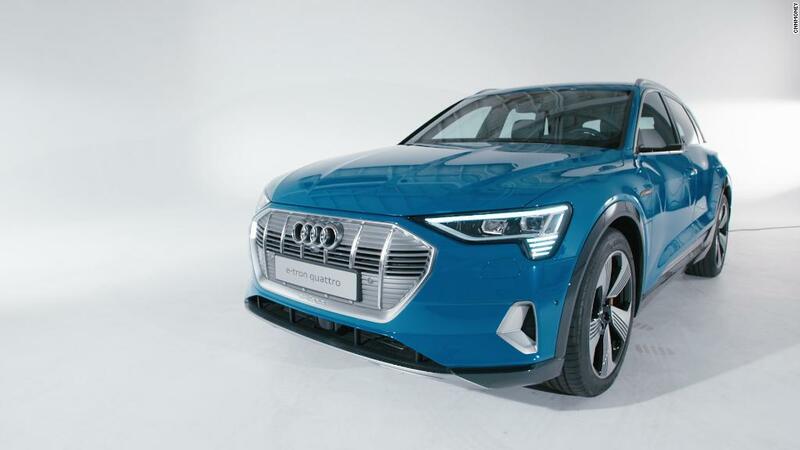 In the E-Tron, the driver will be able to select how aggressively the car uses this system, allowing for "one pedal" driving in which taking pressure off the accelerator pedal will slow the car to a full stop using only the motors. As with other Audi vehicles, the driver will also be able to select different driving modes, from comfortable to sporty, that will alter suspension stiffness, steering responsiveness and how aggressively the SUV accelerates. The SUVs ground clearance is also adjustable by as much as three inches. Buyers will be able to purchase a home charging system and have it installed by Amazon Home Services. The installation can be ordered online. Pricing will vary depending on each homeowner's needs. Audi plans to release two more electric vehicles in the next two years and a total of 12 by 2025.